Ok – I know – I know – some of you are out there shouting at me reminding me they are called “cria.” Baby alpacas are called cria. 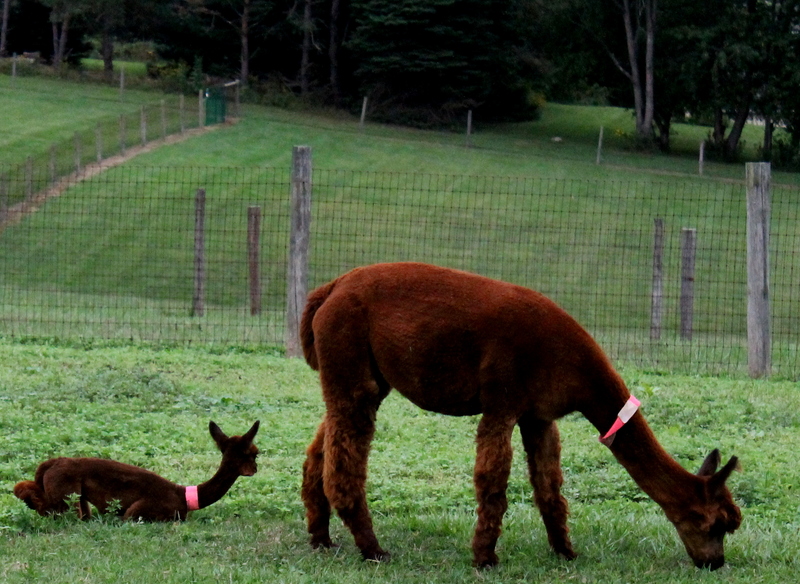 You may recall our friends, Don and Christina Wright, owners of Four Points Alpaca Farm, who I featured in a blog post a few weeks ago when I was just smitten with my first visit to their amazing farm, Inn/Bed & Breakfast, and Alpaca Apparel Shop. 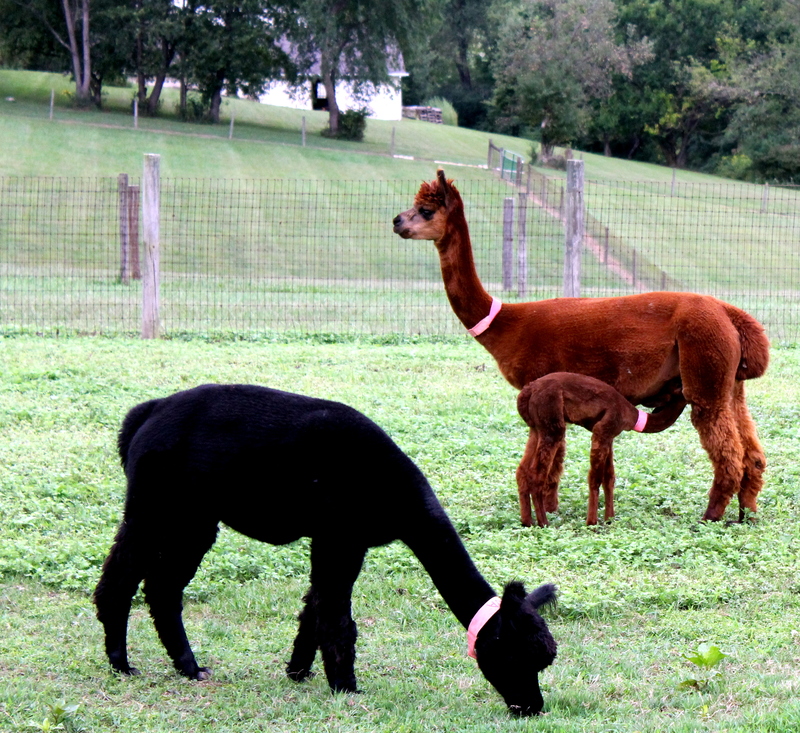 At that time, ten of the Mama Alpacas were due to have babies (cria), and now they are here! 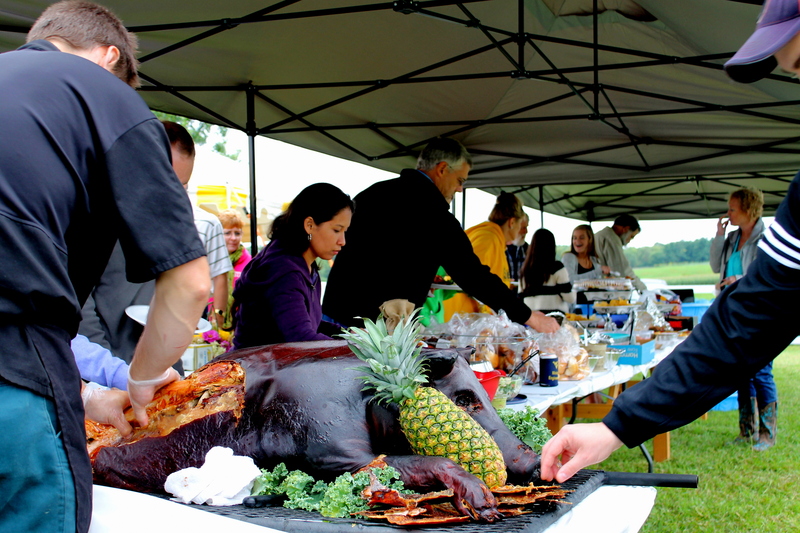 Just in time for showing off at the Four Points Annual Pig Roast! 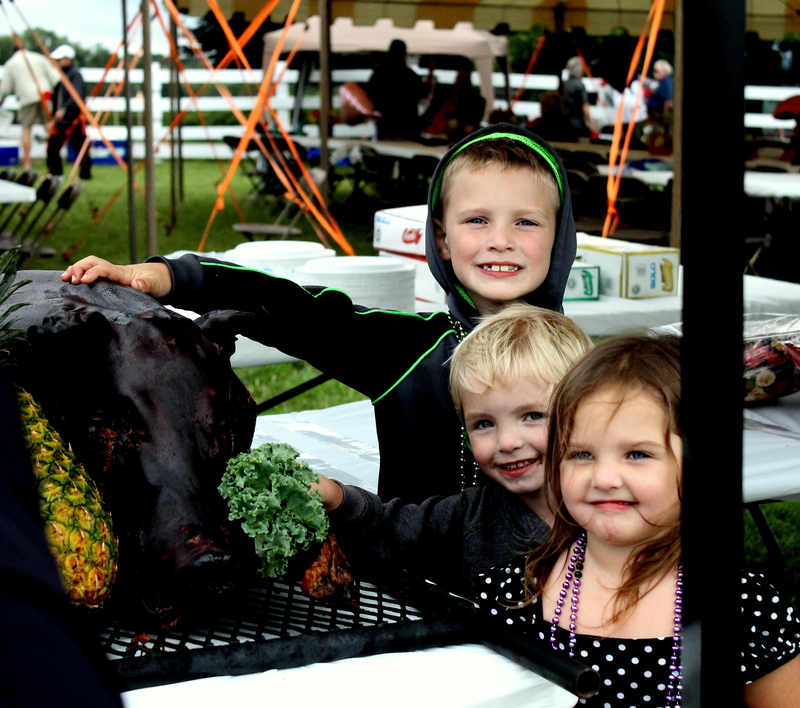 I think Marty was more interested in the pig…..
Look how excited these little cuties were to get their picture taken with Miss Piggy. 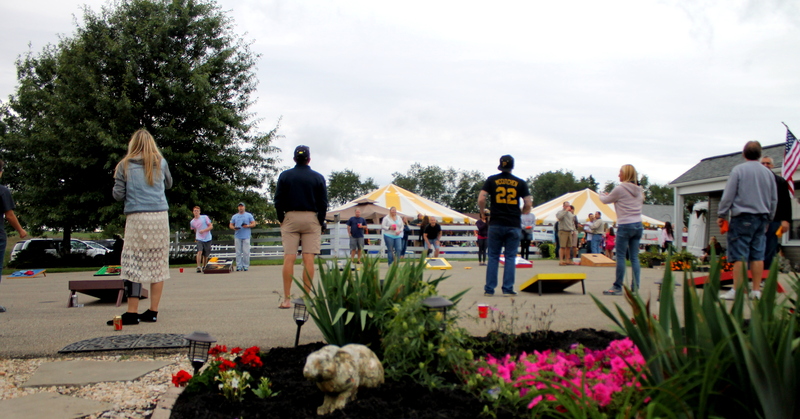 Even an unseasonably cool early September Saturday couldn’t suppress the fun, and a couple of our favorite girls won the Corn Hole Championship! 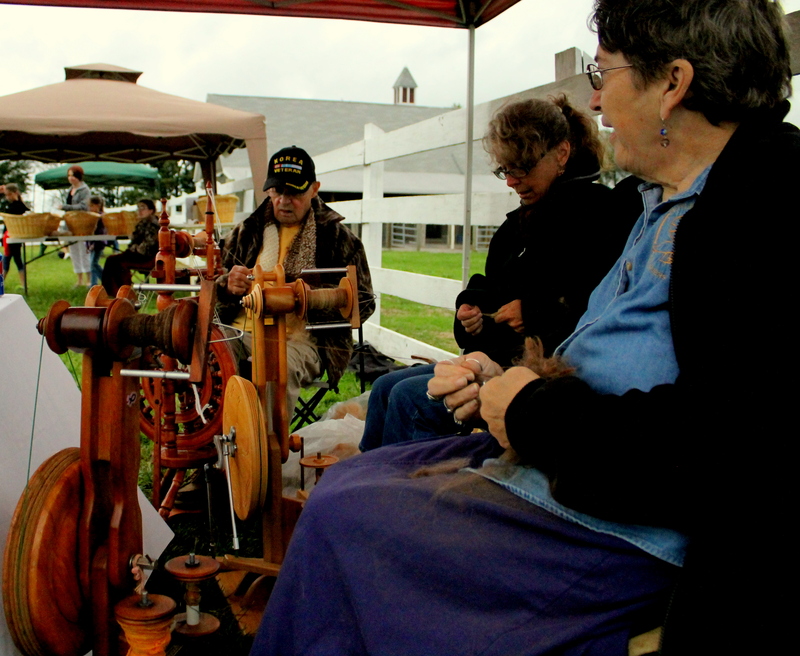 They had a blue grass band, farm tours, games and giveaways, and even a demo of spinning alpaca wool. 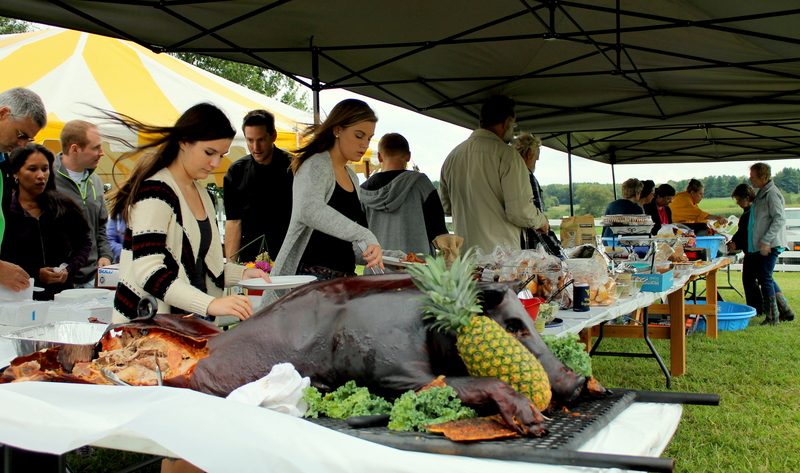 And, of course, some amazing food! 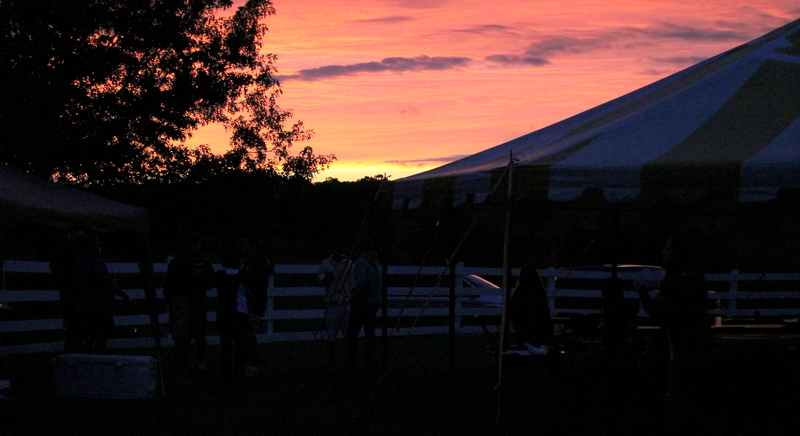 and a bit later, and turning to the West, we enjoyed an amazing sunset. Another great day, with some great friends at Four Points Alpaca! 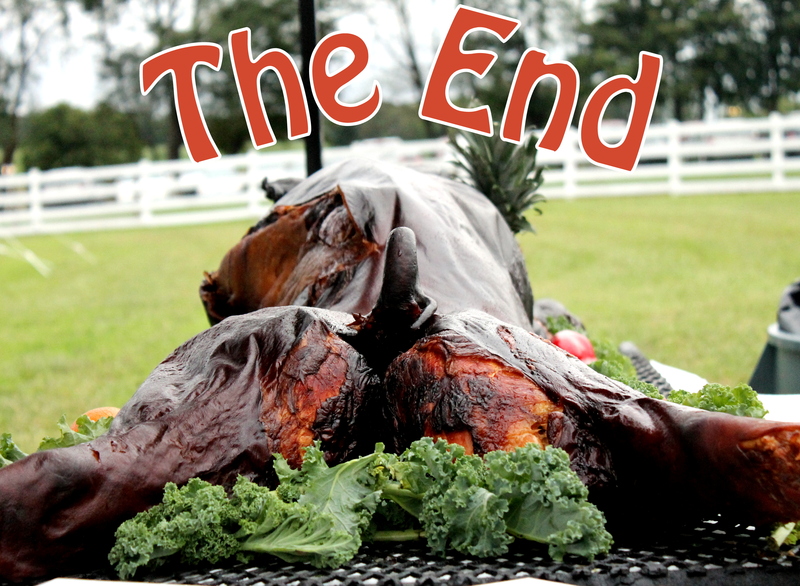 The End, indeed. Oh how fabulously good that crispy pig skin looks. Loved learning about the cria too. 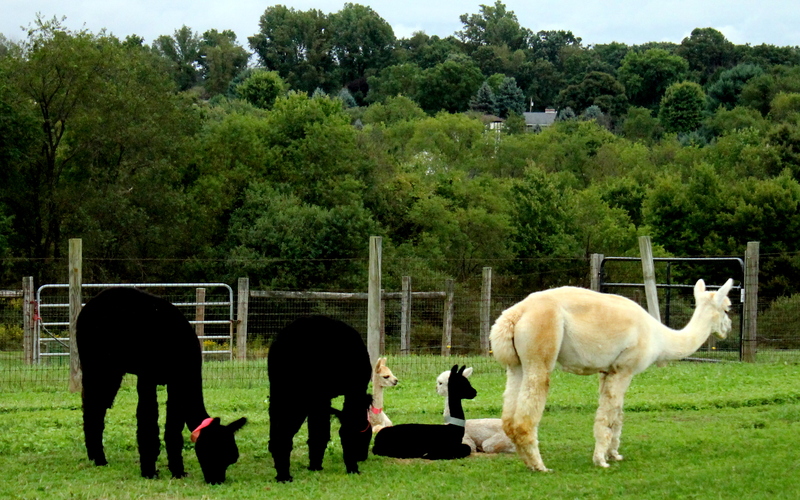 We went to an alpaca farm in the Shenandoah Valley and I bought a pillow stuffed with alpaca hair. Expensive but worth it. Glad you liked my “hog humor” there Barbara! LOL! 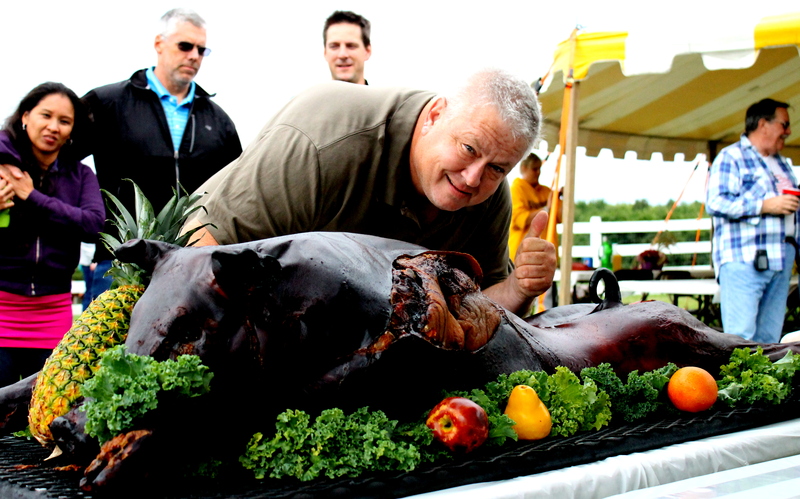 A lot of the folks were pickin’ at that skin, but I didn’t try…. 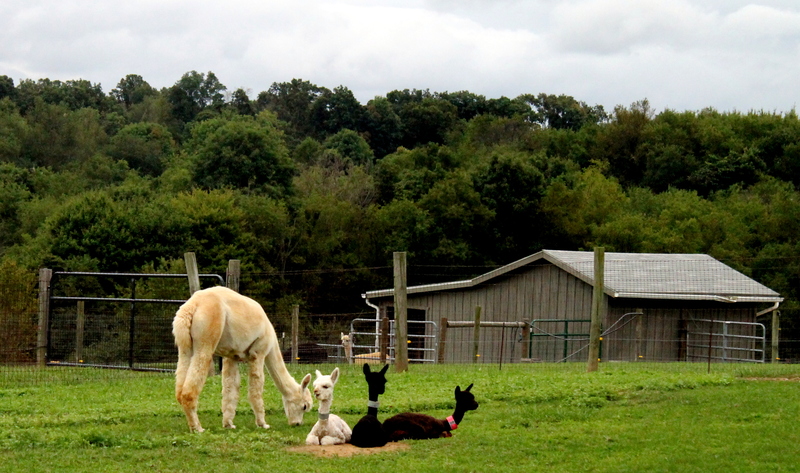 The Alpacas are so stinking adorable – especially the babies, and I’ll bet that pillow is amazing! My hubby has the most amazing pair of alpaca socks that keep his “piggies” so warm! Thanks for checking in my friend! Oh yes, I bought alpaca socks for my old Dad who is always cold and always complaining….he says they are too warm….sometimes I can’t win!! LOL. Wow! You did it again. Thank you thank you! Don and I had hired someone to come and take some pictures but the man did not show up. I was very upset because I didn’t have any pictures accept for two. I will be posting them soon. But, it has really warmed my heart and put tears in my eyes that you would take the time not just once but twice to write about us and our place. Thank you so much we appreciate you and you husband so much. PS. You are right we did have 10 crias coming this year. At the party there were 5, there should have been 6 but we lost him. 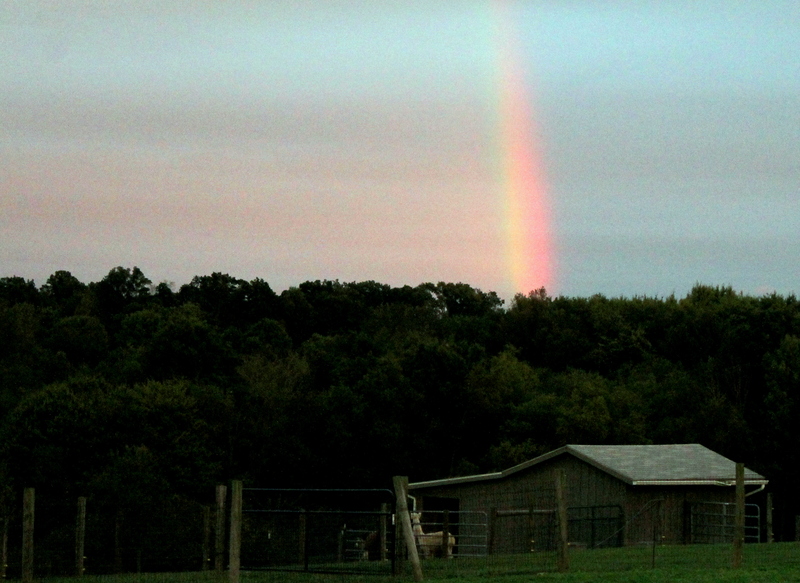 That was a very sad day here on the farm. 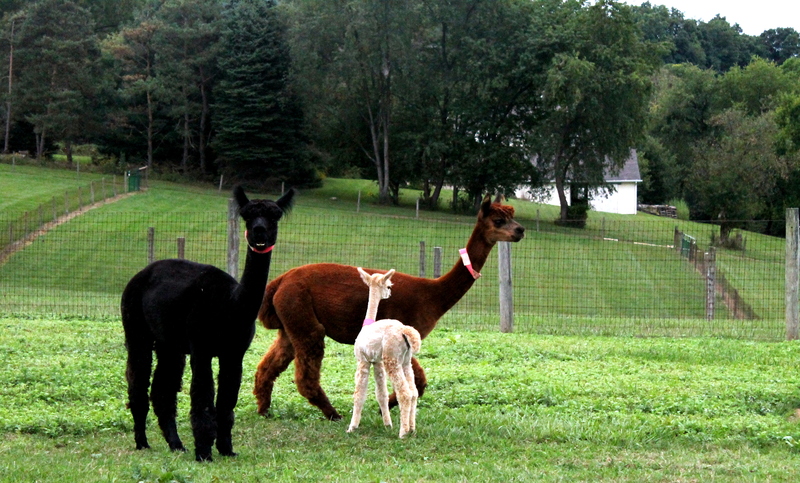 Yesterday, Don and I were out and got a call from our farm help that we have a new cria on the ground. I was so nervous until we got back home but everything is fine. Now, three more on the way for the year and we can relax before the fall shows begin. Thank you again Jodi! 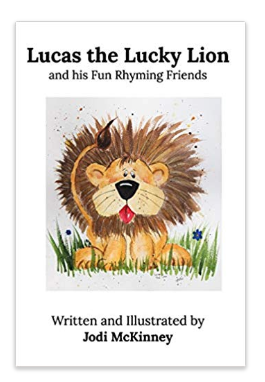 You did awesome…. 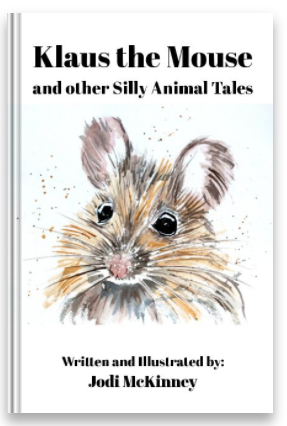 Haha…I do like your hog humor! Looks like a fun time was had by all!